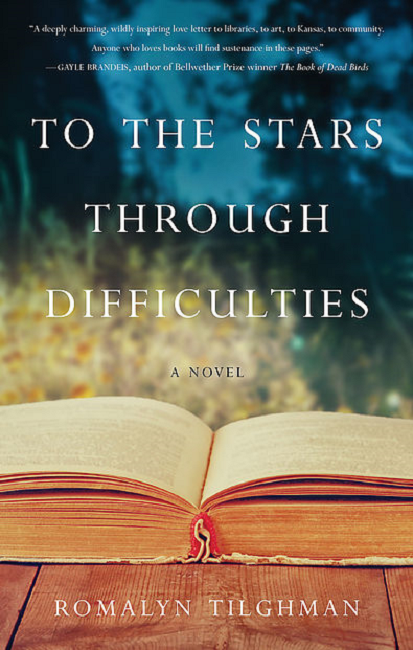 To The Stars Through Difficulties by Romalyn Tilghman takes you through the journeys of three women in very different walks of life. Set in the rural little town of New Hope, Kansas and centered around one of the many libraries that was built by Andrew Carnegie in the 1900’s, it has since become an arts center. The town is divided about whether or not this library should be saved. Each character’s story paints a picture of the world as they see it and the difficulties they face while trying to figure out where and how they belong in this sleepy little town, while also providing the history of New Hope’s fight to have a library in the first place. A little mystery, a little scandal, and a whole lot of internal struggle. The book is broken down by character with each chapter being one of the woman’s stories. We open with Angelina, the granddaughter of a woman who was well-known in the town of New Hope before she passed. She’s coming back to visit for the first time in decades to desperately try and finish up her final dissertation on Carnegie libraries for her PhD. Time is slowly ticking away and she’s not sure how she’s going to write something unique enough to convince the board that this subject is still relevant in the times of technology. But she’s also trying to connect with the grandmother she once knew who sparked her lifelong love of libraries. Traci is a 20-something screw-up who hasn’t been dealt the easiest hand in life. In the middle of trying to find somewhere new to live, she happens upon a wanted ad for a new “artist in residence” for a small art center in podunk nowhere. Perfect. She’s not a traditional “artist” per se, but she’s creative and talented and desperate. Mostly desperate. No one there knows her, and maybe she can be someone new. Coming from New York City, this tiny town is going to be a big adjustment in more ways than one. Gayle. Poor Gayle. She has just survived the scariest night of her life and yet can’t stop reliving it. The home she built with her husband, the town she raised her son in, the entire town of Prairie Hill, Kansas was just leveled in a matter of minutes. With nowhere to go and nothing to salvage, she goes to her sister in the neighboring town of New Hope. Which is complicated, as the towns have been rivals since before there were roads. Looking for hope, a silver lining to this infinite rain cloud would be a lot easier if Gayle could just get a little sleep. I had a lot of love for this book and its multi-layered message about how women have made, can make, and will make history happen even in the most dire of situations. About how the arts are not a lost cause and neither are people. That creativity brings light and hope, no matter where it is found or how little there is to work with. And how you can find yourself by looking at the people around you. Sometimes, they help you see the things you can’t see in yourself. There were a couple of things I struggled with while reading this book. One is that sometimes you would get so far into the history that it would slow down the story a little bit. It only happened a couple of times, but it did change the pace of the book. Two was that I could’ve used a little more Gayle in my life. Her part just felt smaller than the others, and sometimes, I wasn’t sure how she was going to fit into the context of the story and where it seemed to be going. Overall, I would recommend this book to anyone who loves a little history and a little bit of mystery. The story will simultaneously warm your heart and make you want to start a movement in your own little town.